Local green thumbs can roll up their sleeves and help plant 7000 new trees at Telford Park in Darley at the 12th annual Grow West Community Planting Day on Sunday 16th July. The annual planting day is one of the Grow West’s biggest events and is an important opportunity to rejuvenate and restore local landscapes. 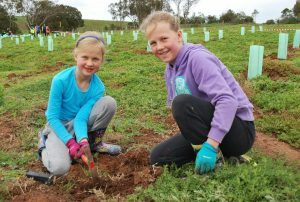 Over the past 13 years, Grow West has worked with thousands of volunteers and hundreds of landholders, who have helped plant over a million trees in the Upper Werribee Catchment. This year, Moorabool Shire Council will be hosting the event at one of their reserves, Telford Park, which is located next to the council offices in Darley, Bacchus Marsh. Telford Park is a 16 hectare park, named after its last private land owner, William Telford, who died in 1928. It was a landfill site during the mid-20th century and while some revegetation has occurred since then, more native vegetation is required to prevent erosion affecting local waterways and to help the site become a refuge for native fauna. Port Phillip and Westernport CMA’s Environmental Projects Coordinator, Helena Lindorff, is excited to be teaming up with Moorabool Shire and the comunity for the event. “We’ve been working with the Council for many years now on their environmental reserves, so it’s very exciting run our annual community planting day at a reserve where local residents will have a direct benefit once this area has been revegetated. “With a bit of work from some dedicated volunteers, this park has the potential to be a significant community asset and improve the health of the local environment. The Grow West Community Planting Day is on Sunday 16th July, 9.30am-4pm, Telford Park, 88 Wittick St, Darley (Mel Ref 327 F12). Lunch and refreshments will be provided. Registrations close 10th July. What to bring: warm clothes, hat, gloves and sturdy footwear. To minimize waste, please bring your own water bottle, cup, plate and cutlery for lunch. To read more about what is planned for the day, download the 2017 Community Planting Day information pack (PDF – 576KB). Help us to promote the planting day! Download and print the 2017 Planting Day flyer (PDF – 459KB). The event has been funded through the Greening the West – 1 Million Tree program which is supported by the Australian Government’s 20 Million Trees Programme (part of the National Landcare Programme).